Nepal has had a strong nexus with Hindu and Buddhist traditions since time immemorial. These solid ties with the two prominent religions of the worlds stand testimony to its popularity of being a mediation and yoga hub. Tourists looking forward to exploring the spiritual belt of Nepal cannot miss some of its best meditation and yoga centers which impart you the long-lost peace of the human mind. Let us see what 10 things you can do in Nepal to enhance your spirituality. Pashupatinath Temple, located in the Kathmandu Valley is one of the most sacred sites in Nepal. The temple complex is home to 235 small temples dedicated to many Hindu Gods like Pashupathinath, Vishu, Shiva, Hanuman etc. The temples are built in pagoda style following the Vaisanava and Saiva traditions. Nepal has plenty of tourist destinations where they can seek peace and warmth for the mind.Swayambhunath Temple is located in Kathmandu Valley and is famous for numerous shrines and Buddhist temples. View the mesmerizing sunset here and lose yourself in the placid surroundings. Tourists looking for spiritual destinations cannot miss Lumbini which is the birthplace of Buddha. Located in Rupandehi district of Nepal, this pilgrimage site is thronged by millions of the people who come away from the raucous of their routine life and find a blissful solitude near the Buddhist monasteries. The prominent sites here are the Maya Devi Temple and the Asoka Pillar. Want to enjoy some lone time in the lap of nature? Duhlikhel offers you breathtakingly beautiful views of the snow-clad Himalayas and agricultural terraces. You can explore Hindu shrines, stupas, and temples of Harisiddhi and Narayan here. Tushita is the favourite haunt of tourists looking for yoga retreats in Nepal. The place is famous for the learning about Vedic philosophies and rituals. While you visit Pokhara, you must not miss visiting the yoga and meditation retreats of Tushita in Nepal. 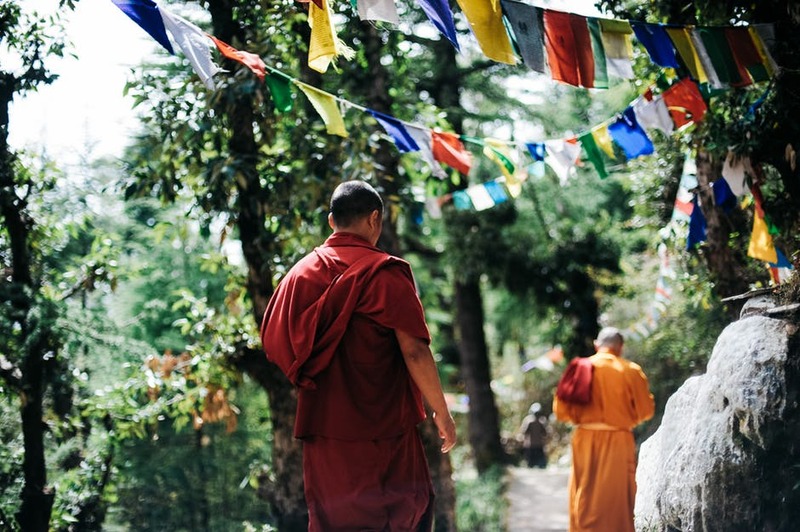 Himalayan Buddhist Meditation Center affiliated with the International Foundation for the Preservation of the Mahayana Tradition is a wonderful destination for tourists on a spiritual voyage. You can participate in their weekly guided meditations. The center has a tie up with a tour company called Dharma Adventures that will take you to Buddhist sites so that you can foray into the yoga and meditation marvel of Nepal. Spiritual tour of Nepal is incomplete without Kopan. This is a popular place to head to in Kathmandu to enjoy the educational and spiritual tinge of Nepal. The monastery is famous for it’s the Gelug tradition of Tibetan Buddhism and houses 360 monks from Nepal and Tibet. The place is famous as Hindu and Buddhist pilgrimage site where hundreds of tourists come and bask in the holy bath at 108 water spouts surrounding the temple. March and June are the busiest part of the year for pilgrims. The architecture of the Temple resembles the pagoda style. You can also go trekking in Nepal from Jomsom Airport that will make your visit more fun. The third highest mountain in the world, Kanchenjunga cannot look prettier from Nepalese boundaries! Not only does the serene and yet so majestic coniferous forests lend you mental peace but you can also make it adventurous by treading on its trekking route. The Boudhanath Stupa is the most prominent Buddhist site in the world. The temple complex is enveloped in the quite of splendid Buddhist monasteries where you can eat, pray, and breathe Tibetan traditions and culture. When in Nepal, you cannot ignore its spiritual tourist destinations and it will only make your trip more meaningful. We are sure once you return form Nepal you will experience new energy and peace instilled in your mind and your body charged. Four Places in Kathmandu Valley I Always Visit to Make Myself Much Happier.